The tragic death of Victoria Climbie in 2000 focussed attention on the effectiveness of social services departments. The Laming reports published in 2003 and 2009 made recommendations for reform, and the 2011 Munro review of child protection referred to gaps in social workers’ expertise. A couple of weeks ago, Sir Martin Narey, fomer CEO of Barnardo’s and previously Director General of the prison service, published his review of the education of social workers. Although Narey recognises the high quality of some social work education, he is generally critical of the admissions criteria, content, quality and regulation of courses and makes a number of recommendations for improvement. What was striking about the report, I felt, was not so much what it said, but what it didn’t say. Narey opens by directly addressing the fact that his inquiry was a one-man one, that evidence was gathered through private interviews, and says elsewhere that he didn’t have detailed terms of reference. Conducting an inquiry in this way has several advantages; it’s quicker and cheaper, reports are shorter, more focused, and more likely to be read and acted on – and as Narey points out, it encourages contributors to be more candid (p.3). There are also disadvantages; the opinion of a single reviewer is more likely to colour the inquiry’s conclusions and no one else can evaluate the evidence they’re derived from – with the best will in the world, people might misremember or misunderstand the evidence they present. In addition, in complex systems like education health and social care, all elements of the system are connected, directly or indirectly. This means it’s often cost-effective in the long-term to remove the causes of problems, rather than to keep putting sticking plasters on the problems themselves. (Ten of Narey’s 18 recommendations involve increased regulation, rather than addressing the causes of what’s going wrong.) In an inquiry with narrow terms of reference the primary causes of problems the inquiry has been set up to investigate might actually fall outside its remit and not even get a mention. This is exactly what appears to have happened in the Narey review. Narey makes it clear that some social workers are very able, are educated to a high standard and have no trouble getting a job when they graduate. But the rest of the picture he paints is a bit bleak. It suggests that school-leavers with low qualifications are being admitted to over-subscribed courses that offer insufficient teaching, inappropriate work placements and that lecturers and supervisors are sometimes under pressure not to fail inadequate students. In 2011 some local authorities had 20% of social worker posts vacant despite nationally almost 30% of Newly Qualified Social Workers (NQSWs) being unemployed; local authorities were clearly reluctant to employ NQSWs perceived as inadequately prepared for the job. Why on earth would this situation arise? Narey locates the causes primarily in the calibre of applicants for social work courses, the content and quality of courses and the availability and quality of supervised work placements. And he makes a number of recommendations related to these factors. It’s apparent from his report, however, that the long-standing crisis in social worker recruitment might be driven by factors that Narey doesn’t explore in detail, such as the level of social worker qualifications, the reasons for the core content of courses, the regulation of social worker education, and university funding. Throughout the 20th century, the level of qualification required to become a social worker rose steadily. In the 1970s Birmingham University offered a postgraduate diploma, a master’s level qualification and a four-year social work degree. In 1994, the national route to qualification became a postgraduate diploma involving partnership with employer, but during the 1990s there was a significant fall in applications. In response, in 2003 the government introduced a three-year social work BA – a sandwich course that included two work placements – or alternatively a two-year MA for graduates. This means that in the last decade the level of social worker qualification has fallen, something that is likely to have had an impact on the expertise of NQSWs and on the willingness of local authorities to employ them. Narey complains about the current focus of social work on ‘non-oppressive practice’ (or ‘anti-oppressive practice’ – he uses the terms interchangeably). He points out that there is a serious downside to a view that encourages working in partnership with, and the empowerment of, parents whose children are at risk. What he doesn’t seem to fully appreciate is that ‘non-oppressive practice’ is, and always has been, fundamental to the ethos of social work. Of course if anti-oppressive practice is the only theoretical framework presented to aspiring social workers, that does pose a problem that should be addressed. Narey entitles his critique of anti-oppressive practice the politics of social work teaching (p.10). Politics is about the distribution of power, so an anti-oppressive model of social work is in a sense ‘political’, but it’s not clear if Narey is using the term in that way, or if it’s because he suspects that this dominant conceptual model originates with the progressive Left (p.13). Having debunked one core concept in social work teaching, Narey introduces another. In his own list of what he thinks social workers should understand he includes child development and attachment theory as two separate items (p.10). 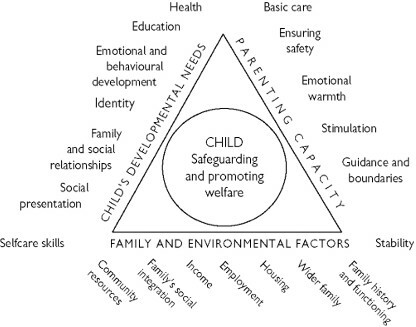 At first glance this looks like one of the conclusions of the Munro review that refers to social workers needing to know about ‘child development and attachment’ (Munro p.96). The difference is that Munro and the sources she cites could be construed as seeing attachment as one facet of child development, whereas Narey unambiguously presents them as distinct issues. My conclusion in previous posts about attachment theory is that there’s a serious risk of social workers seeing child development not as involving attachment, but solely in terms of attachment, rather than as a highly complex set of interacting biological, social and environmental factors of which attachment is only one. Narey’s suggestion is likely to perpetuate that over-simplification. Intriguingly, given his focus on conceptual models in social work, Narey says he has never discussed the international definition of social work with the current Secretary of State for education or with any of his predecessors (p.13). It would be interesting to know why. Narey isn’t the only one to take issue with the content of social worker education. There’s also disagreement between universities and employers, but much of it appears to centre on the difference between education and training. It seems fair to argue that social workers’ education should include statutory frameworks, but it’s debatable whether signs of abuse, a highly specialised skill, should be included in education or be approached via on-the-job training. My guess is that the problem actually boils down to who pays for what. The budgets of universities and local authorities have been under pressure for many years, and it’s understandable why local authorities might want social workers to emerge fully formed from their university courses, but that universities don’t want to broaden what they offer unless they have to. The ultimate losers are, tragically, the most vulnerable members of society that social workers are supposed to support. Narey draws attention to the facts that social worker education is regulated by three different bodies and that universities need to consult at least five different source documents to shape the academic content of courses. He observes in respect of the Health and Care Professions Council (HCPC) that social work sits ‘very oddly’ with the list of other professions it regulates (p.21). Social work isn’t the only profession in this situation. In 2009, the HCPC replaced the Council for Professions Supplementary to Medicine (CPSM) set up in 1960, which regulated several professions that fall broadly under the umbrella of medicine. When the HCPC replaced it, the regulatory remit was broadened and practicing psychologists and social workers were added to the mix. This caused some consternation amongst psychologists, previously regulated by their own professional body, many of whom didn’t see themselves as working in professions related to either health or care. Only two of psychology’s protected titles – clinical and health psychology – could be clearly classified as involved in health or care whereas others covered fields as diverse as international educational systems and business management. Doubts were expressed as to whether the HCPC could have the range of expertise required in order to regulate effectively. From what Narey reports, it’s still a relevant question. I mentioned earlier the three-year BA in social work introduced in 2003, following a fall in applications for social work courses. Narey doesn’t address the causes of the drop in applications, but it’s worth considering what it they might be. Prior to 1945, some students from less well-off families could access a university education via much sought-after Board of Education grants, often on condition that they became teachers after graduation. In 1962 student funding by local education authorities became mandatory. A steady increase in student numbers coupled with a policy decision to increase the numbers of graduates and universities, led to the Dearing review of university funding in 1996, which recommended the introduction of an annual contribution of £1000 toward tuition fees, and in 1999 student loans were introduced. That meant that a four-year social work qualification was a relatively expensive way of getting a degree, so it’s hardly surprising that applications fell. In an attempt to boost social worker numbers, the three-year BA was introduced in 2003, accompanied by the offer of a bursary. The bursary, counterintuitively, appears to have had little impact on social worker recruitment, but does appear to have encouraged applicants wanting a low-cost route to a degree (p.28). Subsequent reductions in government funding have resulted in universities becoming increasingly reliant on student fees as a source of income; universities can now charge UK students up to £9000 p.a. and students from overseas usually pay much more. It appears that some universities have adopted a ‘pile ’em high’ approach to social work degrees, attracting large numbers of students but failing to provide them with the qualifications that employers are looking for. Times change, and social workers are no longer preoccupied by the impact of industrial injuries or poor sanitation as they were in 1908 (although hygiene is still an issue). But as far as I can see the social worker role is fundamentally unchanged; it still has to address the problems people encounter often as a result of societal factors over which they have little control. That doesn’t appear to be how social work is viewed by central or local government, however. In the last three decades, there’s been a noticeable shift from viewing social workers’ clients as people who are primarily victims of circumstance, to viewing their problems as the outcomes of individual choices. Both ways of framing people’s problems are over-simplifications and neither is helpful, because in reality everybody’s problems are due to a complex interaction of systems pressures and individual choices. Another apparent shift is in respect of the focus of social work. Narey advocates not only restoring the option to specialise in adult or child social care following basic generic tuition, but also suggests the development of children’s social work degrees. Although specialisation seems justified, from the outside it looks as if social work is becoming increasingly polarised, toward care for the elderly at one end of the spectrum and toward children at risk at the other (p.37). In other words, adult social work will be about care of the elderly and children’s social work will be about child protection, as if adults and children had no other issues to deal with. The location of the source of problems in the individual – or in individual organisations (universities and regulatory bodies in the case of the Narey report) – is an inevitable consequence of successive governments adopting a ‘market’ model for services. This is because the free market model rests on assumptions about the behaviour of individuals; that people make rational decisions, that they have free choices about the goods and services they purchase and that their free, rational choices ensure that competition between suppliers drives up quality. In reality none of these assumptions holds true. The narrow terms of reference of the inquiry have resulted in the impact of some key systems issues being overlooked. These include; the underlying economic model chosen by government for the delivery of public sector services, the way context and individual behaviour are framed by government, the remit of regulatory bodies, the way the underlying purpose of social work is perceived, and how higher education is funded. And a shift of the focus of social work from problems at all levels from the individual to the societal, is an inevitable consequence of shrinking the public sector; as a result there will be a tendency to focus on people most at risk, rather than in addressing the underlying systemic causes of a wide range of obstacles that people encounter when they are trying to get on with their lives. •	It’s policy-based rather than evidence-based – an evidence-based model would give weight to all factors of child development.